Thank you for preregistering for the WBAWL Hike for Hounds 5K Run/Walk on Saturday, September 14, 2019! We look forward to having you join us for the Wythe-Bland Animal Welfare League’s fourth annual 5K to raise funds for all WBAWL programs. The event will be held rain or shine (warm or cold)! Packets will be available from 8:00-8:30 a.m. in the registration area in front of Smyth Hall at Wytheville Community College. No refunds will be given, though we can transfer registration to another person in your place. All participants who preregister by September 1st will be guaranteed a free T- shirt. Extra shirts will be ordered and will be given out on a first-come, first-served basis to those who preregister after September 1st and then to those who register the day of the event. The run/walk will begin promptly at 9 a.m. 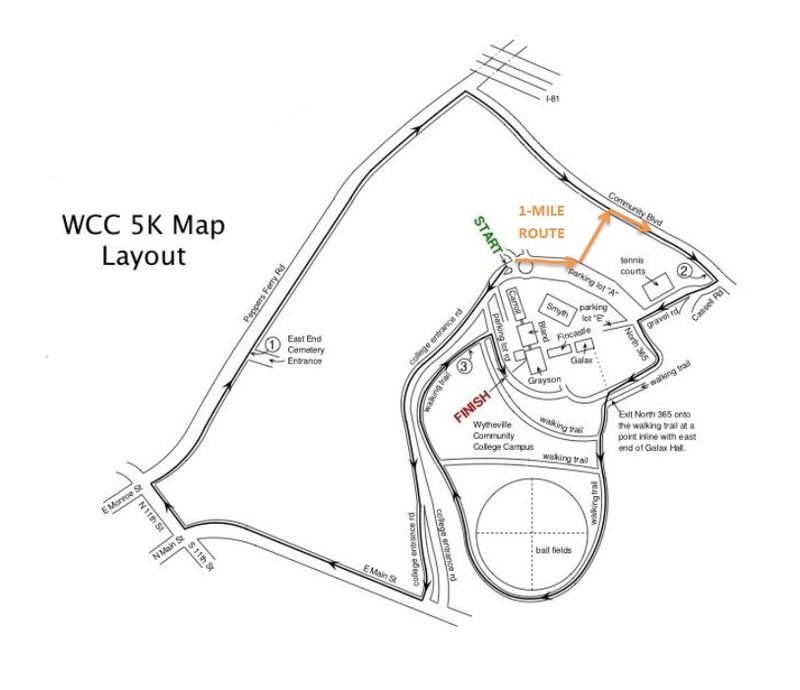 Please make sure to arrive on the event site no later than 8:30 a.m. on Saturday morning, as the main road to campus will be partially blocked prior to the run/walk start. The address is 1000 E. Main Street, Wytheville, VA 24382 for those coming from out of town. A campus/route map is shown below. Parking will be available in the upper parking lot in front of Smyth Hall. Please note that the lower Carroll Hall parking lot will be closed to all traffic the day of the event. Smyth Hall will be open for rest room access. Pets are not allowed inside the buildings at the college. Pets must be on a leash not exceeding 6 feet long and must be up to date on vaccinations and licensing. Owners must clean up after their pets. For safety reasons, runners with pets must line up behind runners without pets at the starting line. Headphones are prohibited on the race course. Strollers are permitted; children in strollers must remain in strollers for the entire course. Runners and walkers may use only the right lane of the road and must not block vehicle traffic in the left lane on Main Street, 11th Street and Peppers Ferry Road. There will be cones directing traffic to stay in the left lane. The course does take a few turns, which will be clearly marked. Please pay attention to the signs and the volunteers who will be posted along the course to make sure all runners/walkers stay on the route. 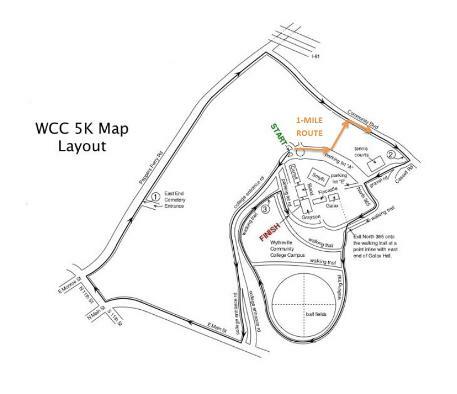 A water station will be located roughly halfway through the course on Community Blvd. There will be water for people and water in bowls for dogs at the start, halfway point and the finish. We are thankful for the many community sponsors who have helped make this event possible. We will have event day support from Richardson Ambulance Service, the Wytheville Police Department, the WCC Police and the Wytheville Fire Department. If you come in contact with any of these folks, please make sure and say thank you! We are excited about seeing you all at the Hike for Hounds, and we look forward to putting on a fun and safe run/walk to help raise funds for WBAWL’s programs! If you have questions about any part of the event, please contact us using the form below. I have a question about the 5K.